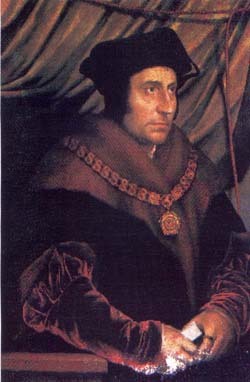 St. Thomas More, Martyr (Patron of Lawyers) St. Thomas More was born at London in 1478. After a thorough grounding in religion and the classics, he entered Oxford to study law. Upon leaving the university he embarked on a legal career which took him to Parliament. In 1505, he married his beloved Jane Colt who bore him four children, and when she died at a young age, he married a widow, Alice Middleton, to be a mother for his young children. A wit and a reformer, this learned man numbered Bishops and scholars among his friends, and by 1516 wrote his world-famous book "Utopia". He attracted the attention of Henry VIII who appointed him to a succession of high posts and missions, and finally made him Lord Chancellor in 1529. However, he resigned in 1532, at the height of his career and reputation, when Henry persisted in holding his own opinions regarding marriage and the supremacy of the Pope. The rest of his life was spent in writing mostly in defense of the Church. In 1534, with his close friend, St. John Fisher, he refused to render allegiance to the King as the Head of the Church of England and was confined to the Tower. Fifteen months later, and nine days after St. John Fisher's execution, he was tried and convicted of treason. He told the court that he could not go against his conscience and wished his judges that "we may yet hereafter in heaven merrily all meet together to everlasting salvation." And on the scaffold, he told the crowd of spectators that he was dying as "the King's good servant-but God's first." He was beheaded on July 6, 1535. His feast day is June 22nd. The following is reported to have been written while St. Thomas was imprisoned in the Tower of London. Give me the grace, Good Lord to set the world at naught. To set the mind firmly on You and not to hang upon the words of men’s mouths. To be content to be solitary. Not to long for worldly pleasures. Little by little utterly to cast off the world and rid my mind of all its business. Not to long to hear of earthly things, but that the hearing of worldly fancies may be displeasing to me. Gladly to be thinking of God, piteously to call for His help. To lean into the comfort of God. Busily to labor to love Him. To know my own vileness and wretchedness. To humble myself under the mighty hand of God. To bewail my sins and, for the purging of them, patiently to suffer adversity. Gladly to bear my purgatory here. To be joyful in tribulations. To walk the narrow way that leads to life. To have the last thing in remembrance. To have ever before my eyes my death that is ever at hand. To make death no stranger to me. To foresee and consider the everlasting fire of Hell. To pray for pardon before the judge comes. To have continually in mind the passion that Christ suffered for me. For His benefits unceasingly to give Him thanks. To buy the time again that I have lost. To abstain from vain conversations. To shun foolish mirth and gladness. To cut off unnecessary recreations.